Australians Ash Barty and Ajla Tomljanovic are knocked out of the Internazionali BNL d’Italia in the first round. Australian No.1 Ashleigh Barty has been knocked out in the first round of the Internazionali BNL d’Italia by three-time champion Maria Sharapova. Making her debut in the main draw in Rome, the 16th-seeded Barty produced a battling performance to take the five-time Grand Slam champion to a deciding set but eventually came off second best, 7-5 3-6 6-2. Australian qualifier Ajla Tomljanovic went down 6-0 6-4 to Russian 14th seed Daria Kasatkina. Daria Gavrilova is the last Australian player left in the singles draws in Rome and she takes on third seed Garbone Muguruza on Wednesday. Sharapova, who has been struggling to find her form after first-round exits in Stuttgart and Indian Wells and a year on from her return to the court after a doping violation ban last April, needed two hours and 32 minutes to eliminate her battling opponent. 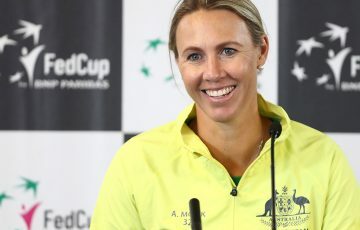 “She made me hit a lot of balls, and that’s the reason why she’s doing so well, seeded here and had the results that she has,” Sharapova said. Sharapova made a confident start against Barty with an early break but was still prone to mistakes when switching from her backhand to the forehand side. Her 22-year-old opponent broke serve to pull level at 5-5 in the very first meeting between the two players. A vicious forehand winner on the line and a Barty net error secured the first set in 50 minutes for Sharapova. 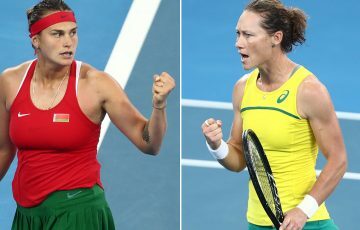 The Russian looked shaky in the second set as a handful of unforced errors saw Barty break her serve twice as the world No.18 levelled the match with a solid service game to force a deciding set. Sharapova, ranked No.40, then saved three break points to remain even with Barty at 1-1 in the final set before a remarkable lob that caught the baseline gave her the lift she needed to finally get a vital break. 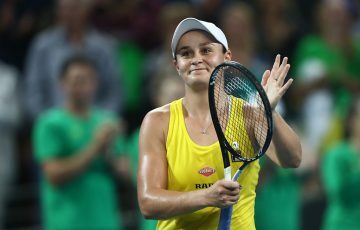 Her revival at the crucial moment drew a nervous double fault and a set of forced errors from Barty when she traded in a rally to concede defeat to the former world No.1. She now meets Slovakia’s Dominika Cibulkova in the next round, who defeated Italy’s Francesca Schiavone.